Police officer Constable Michelle Evans in hijab with a rifle and rose outside Christchurch Memorial Park Cemetery, as victims of the mosque shootings are buried. First it was the image of Prime Minister Jacinda Ardern wearing a hijab that captured the world’s attention. 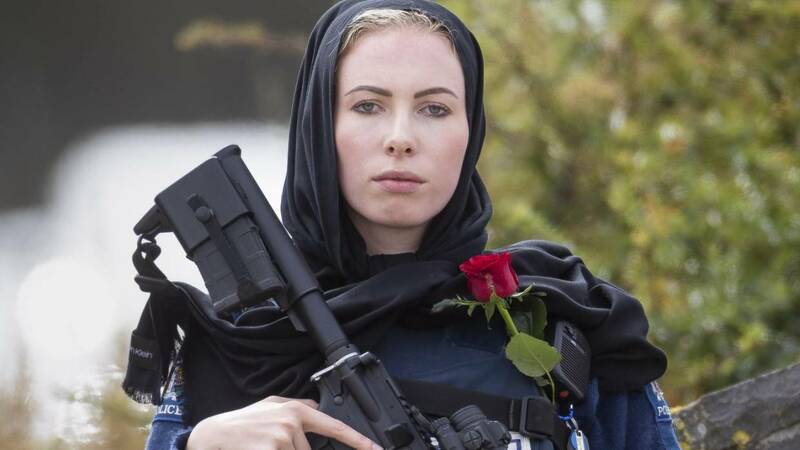 Now a photograph of a young female police officer guarding the Memorial Park Cemetery in Christchurch on Thursday is being shared widely. 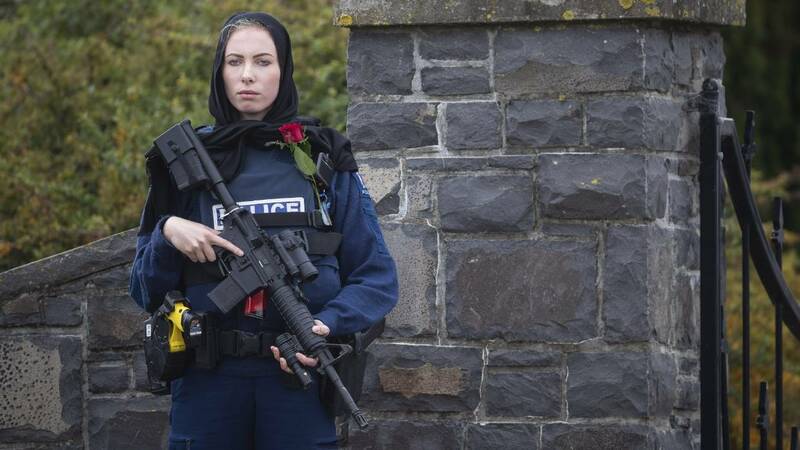 It’s a powerful image that combines solemnity, respect and protection.Constable Michelle Evans is wearing a Calvin Klein scarf over her head, a red rose on her chest and is holding a Bushmaster semi-automatic rifle. Stuff photographer Alden Williams said it was the mix together of the those three items that caught his eye. Williams said most of the media seemed to be focusing on the arrival of the Mongrel Mob with families at the cemetery, where shooting victims were being buried. Constable Michelle Evans stands guard. And “this photo is so incredible, beautiful and powerful”. Evans grew up in Whanganui and joined the police there.In a 2016 profile in the Whanganui Chronicle ,when she was 22, she said wanted to be a police officer from a young age. She enjoyed frontline work and said even though people were hostile at the start, they would often calm down when she and other officers began dealing with them.